These lightened-up red velvet pancakes are made with a blend of white whole wheat flour and all purpose, then topped with a light cream cheese topping. 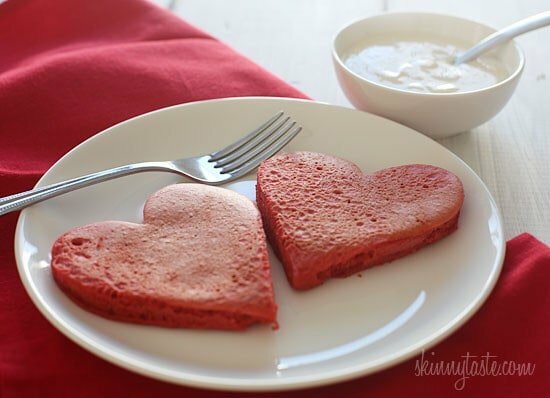 I adore red velvet, so I can’t think of a more fitting time to make red velvet pancakes, then for Valentine’s Day! More great Valentine’s Day holiday pancakes are Heart Shaped Chocolate Chip Banana Pancakes, Brownie Batter Pancakes, and No- Bake Strawberries and Cream Crepe Pie. I don’t eat pancakes every day, instead I save them for special occasions, like holidays, birthdays and blizzards! This weekend Nemo hit the North East, which kept most of us indoors or digging our way out. We got around 8 to 10 inches which wasn’t too bad, my daughter was really excited to finally use her snow suit and sled. While my daughter and husband played outside in the snow, I decided to test out these pancakes. 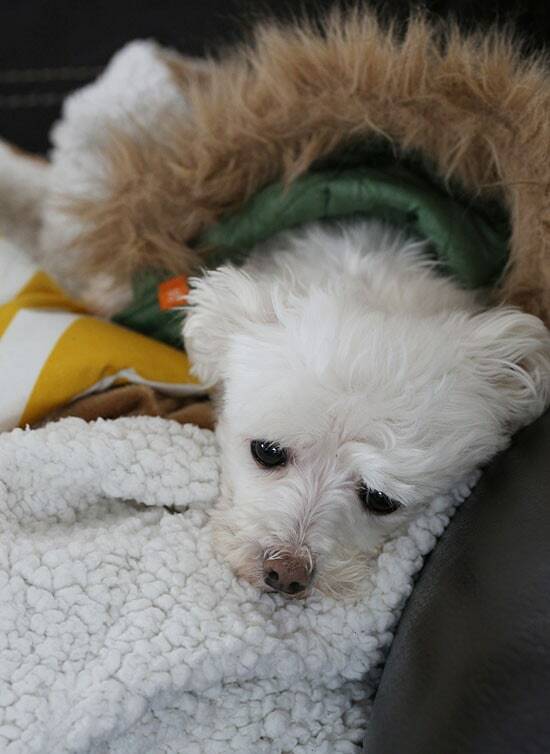 My puppy wanted no part of the snow, so he found a cozy blanket and just laid around all morning. I spent quite a bit of time testing these pancakes out to get them just right. Finally after my third attempt I got them perfect! Fluffy, with just the right amount of sweetness. This was modified from my whole wheat pancake recipe, I simply added some cocoa powder and food coloring and since this is topped with a cream cheese topping rather than maple, I felt the batter needed to be sweetened a bit, so I added a touch more sugar. My husband, was my taste tester and tasted each and every round until we got a winner. If you’re watching your sugar intake, you can certainly substitute the sugar for Stevia or Splenda, or whatever sweetener you prefer to use. You can prepare the batter the day before and keep it refrigerated for up to 2 to 3 days. The cream cheese topping will also last about 3 days refrigerated. 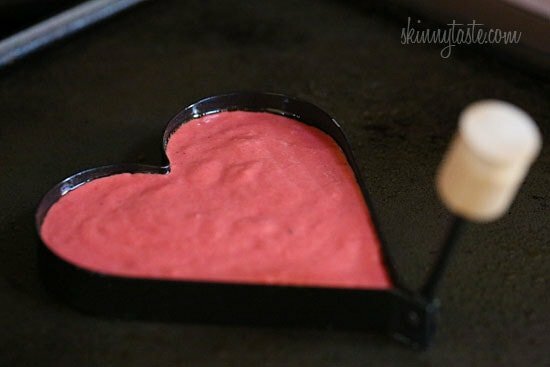 I used my heart shaped pancake molds which only makes one at a time, so if you plan on doing this and making a lot, I recommend buying more than one mold. It also tends to stick so spraying the mold first helps prevent this. Combine the cream cheese topping ingredients, set aside. Mix the flours, baking powder, cocoa powder, sugar, and salt in a large bowl. In another dissolve the food coloring with the milk; whisk in egg and vanilla. Combine the wet and dry ingredients until there are no more dry spots, careful not over mix. Heat a large non-stick griddle pan on medium-low heat. When hot, lightly spray with oil to coat and pour 1/4 cup of pancake batter onto the pan. To serve, place two pancakes on each plate, then top with about 2 1/2 tbsp of cream cheese topping. Today is my niece's 5th birthday. I asked her what she wanted for breakfast and she said, "It's my day! I want pancakes, please." So I thought it'd be a perfect opportunity to make these. They were a hit! Would whole wheat pastry flour work in place of regular whole wheat flour? I made these YUMMY pancakes today for breakfast. They were so easy to make and amazingly really good. I usually make pancakes from boxes but this will change my mind. I omitted the red paste and substituted Almond Milk and they turned out so good I personally ate them as is with no topping or syrup or anything. I would make these as a snack too. Thank you Gina! I made these for Valentine's dinner and we all loved them!!! My batter was a bit thin (and I didn't have a heart mold), so due to my dumb electric cooktop, I mostly had amoeba-shaped pancakes, but they tasted great! I could definitely taste the hint of cocoa. The cream cheese topping is AMAZING!!! You should bottle that stuff and sell it – I'm eating the extra with EVERYTHING! 🙂 Thanks again for another winner, Gina! Until I whipped the topping with a hand mixer I was not getting a creamy topping like I was expecting. Next time I may add a little powdered sugar & less honey to thicken it up more. The pancakes & topping were delicious! And just a note for someone just trying the recipe, the longer the topping sat, the thicker it became. Enjoy! Made these for my husband for Valentine's breakfast today, since red velvet cake is his favorite dessert. They were delicious! I made the batter and frosting ahead of time–the frosting wasn't mixing well with just a spoon so I threw everything in a mini food processor, and the frosting came out creamy and perfect. I made regular-size pancakes and used a heart-shaped cookie cutter to make them cute little hearts. Perfect! I made the batter and topping last night, and then cooked them up this morning — they came out great! I would definitely recommend softening the cream cheese first, though. My sauce came out kind of chunky because I wasn't ablle to fully incorporate the cream cheese…. I was a little concerned about the texture of the batter — it was very thin and a little frothy, but they came out just fine! I made these for pancake tuesday and my son loved them, especially the cream cheese topping. I usually make your banana chocolate chip pancakes for breakfast, these were fun. wow, these pancakes look amazing! definitely going to try them tomorrow, thank you!! 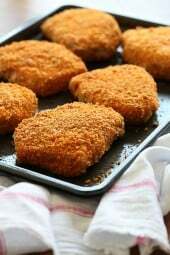 This is my first recipe from this blog. This is what I found when I made these this morning. Pancakes: I used 1/2 cup whole wheat as I did not have white whole wheat. I used 1/4 baking Splenda and liquid food coloring, a bit less than 1/4 tsp. Also didn't have a mold so made them just round on a griddle. I though they tasted like pancakes. There was, in my opinion, no specific red velvet flavor. I find this to be the case with most "home made" red velvet recipes. Guess I will keep searching for the perfect one. Also, in my hands, the pancakes were kinda chewey. Topping: runnier than I expected. Tasted more like honey than cream cheese. If I try these again, will use a different low fat cream cheese topping. Overall, not sure they're worth the effort. The pictures were cute though!! These look awesome! I think I am going to have to wake up early tomorrow and make these for Valentine's Day! Can i ask what is white whole wheat? I wanna make them for breakfast over the weekend and wanna make sur ei have all the ingredients right. They look delicious! love that cream cheese topping! Your pup is adorbs! I have a shihtzu that's 7 lbs too so tiny and snuggly. I'm wondering where you found those red placemats with the love stitched on them? Thanks for posting this delicious breakfast idea! Just wondering – do you know what would the points value be without the cream cheese topping? do you think this batter would work in a waffle iron? 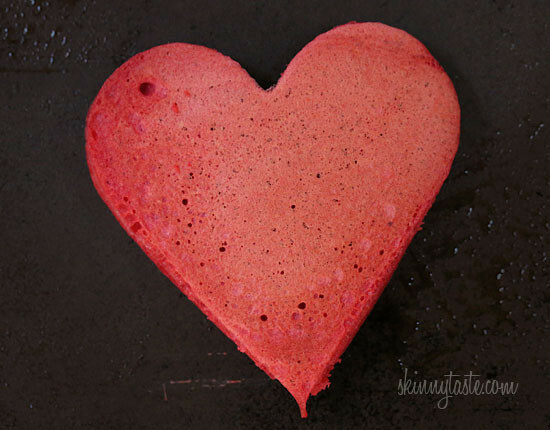 i have a heart shaped waffle iron i was going to use on thursday morning – but i love this batter! I bet you could just make these without the pancake mold and then use a heart-shaped cookie cutter to cut out minis!! Adorable. Wow these look really good. I will have to make those! I just love your site. The recipes never disappoint! 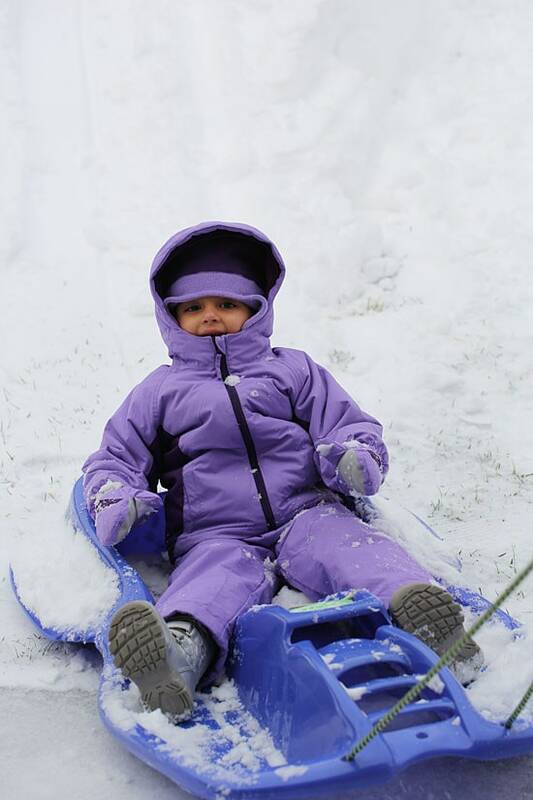 Your daughter is adorable in her little snowsuit! I just wish you guys would quit hogging all the snow! ; ) (I live in Abq., but am a former New Yorker, and homesick!). That recipe definitely looks like a winner for my "Sweet Sunday" breakfast! I agree with the other comment that although the "these look so good" and "can't wait to try these" comments are positive and supportive, they aren't terribly helpful… I like to read the comments for reviews of how the recipe turned out or how it was received and comments to that effect are more useful. Just my two cents. I have no say on what comments people leave, but if you read comments from the bottom up, that usually helps. I find it revaulting that people feel the need to come onto this woman's site & make such comments! If you happen to make a recipe & don't like it who cares? I'm sure you've wasted much more money in your lifetime! Gina's recipes are amazing but not everyone's tastes are the same. Make at your own risk but 9 times out of 10 you won't regret it! Thanks Gina for taking your time to provide me & my family with healthy & delicious ways to make foods that I love at no charge!! Can you use just regular food coloring drops? lOVE THIS RECIPE TOO. I'VE MADE YOUR BANANNA NUT PANCAKES 3 WEEKENDS IN A ROW. WE LOVE THEM. WILL MAKE THE RED VELVET THIS WEEKEND. ENJOYED YOUR PICS. that looks delicious! I will definitely try this! Perfect for valentine's day! Never thought to try red velvet pancakes but this sounds yummy! Definately had to pin it! I feel silly asking but what is white whole wheat flour? Is it very different from regular whole wheat? Yes, it's lighter in color than whole wheat and has all of the nutritional advantages of traditional whole wheat, but with lighter color and milder taste. Where do I get the heart-shaped pancake maker?! It's so cute! I got 4 heart-pancake molds when I purchased the All-Clad griddle at Macy's. 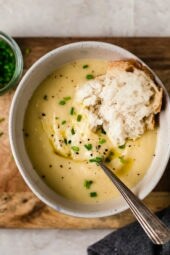 Can someone please make this recipe and tell me what it tasted like? No offense, but I'm getting really sick of the "these look good," "can't wait to make these" comments. It seems like the majority of all comments on this website are the two above comments. I'd like to know if making this would be worth my time. LOL! Why don't you go ahead and make them Fariah, and then tell US what YOU thought? She just posted the recipe yesterday, what do you expect? Hi Gina, Happy Valentine's Day! I love your heart shape pancakes, look very pretty. Your daughter and doggie look very cute too! These look perfect for this Thursday! Oh Gina, your daughter and your dog are both ADORABLE!!!!! I can't wait to make these for my ten year old for Valentine's Day! Whenever I make something that tastes good both her and my husband ask if it's skinnytaste. Could I make this in a waffle maker?! Love the pancakes. They are the cutest pictures! Now this is what I want to wake up to on Valentine's Day! 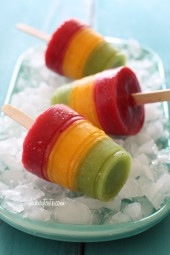 These look lovely and simple to make. Thanks for sharing! What cute pictures of your daughter and pup! 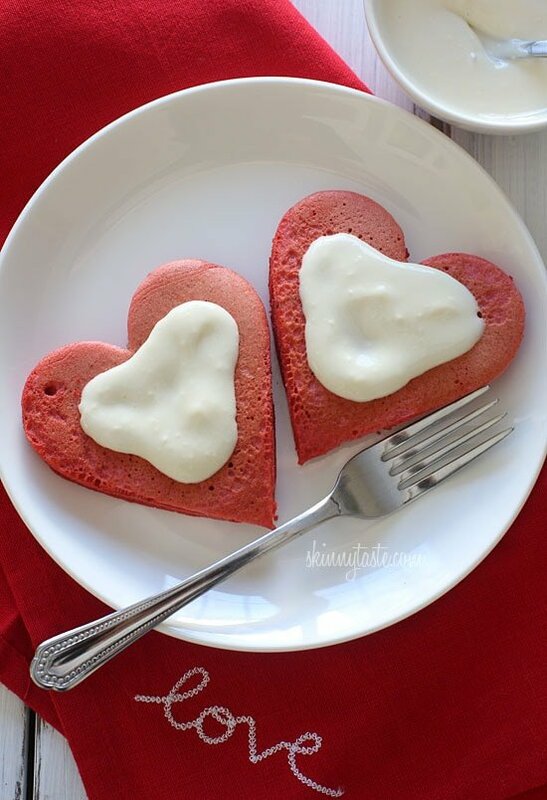 And the heart shaped red velvet pancakes are perfect for Valentine's Day! Would regular red food coloring work, or is the color not strong enough? I'm more concerned with the taste than the color, though. Sure, but you'll have to use more. Can the batter be made the night before, stored in the refrigerator and used in the morning? Oh my goodness. I love dogs even more than I love food, and that furry little face made my day! I can't believe he's full grown! Is the point count including the frosting? It says…. "2 pancakes + cream cheese topping"
Sooo, does the puppy come with the pancakes? Yes these pancakes look delicious! A perfect treat for Valentines Day! Your puppy is adorable! What kind of dog is he? He's a maltese, isn't he cute! He's fully grown, only about 6 lbs.